What is another word for regions? district, districts, province, provinces, territory, Territories. 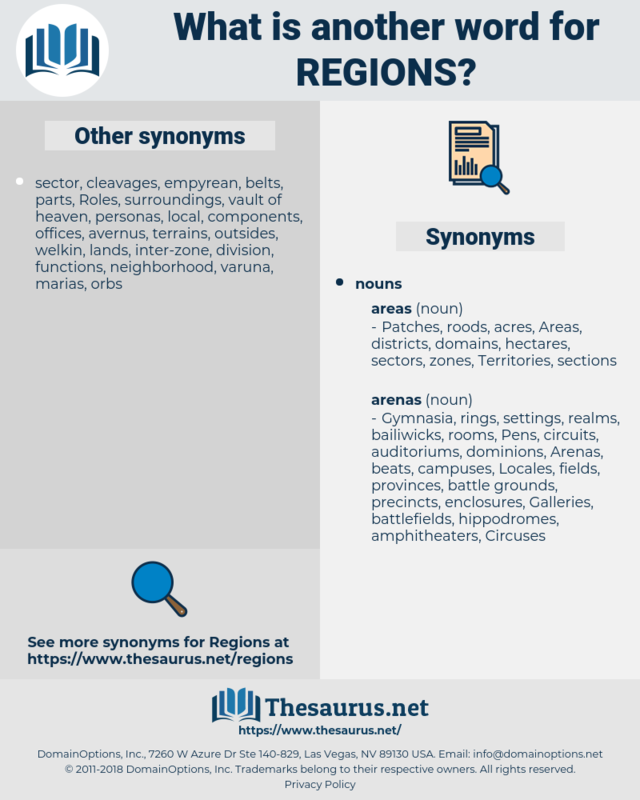 subregions, sub-regions, Cities, parts, jurisdictions, lands, sections, towns, sites, basins, localities, Counties, Locales, states, tracts, Boundaries, districts, provinces, Territories. regiones, assistance, directive, Ros, affairs, RDCS, departments, places, Canadians, mayors, zonas, *, fields. regionale, education, engineering, fields, european, committee, saskatchewan, india, performance, facsimile, agency, council, institute, Cor, NRCAN, la, cape, They, justice, CFI, /, 1998-2005, act, tuesday. Neighborhoods, Religions, Organizations, governorates, neighbourhoods, Populations, portions, administrations, organisations, destinations, continents, conservation, cooperation, disadvantaged, foreigners, nations, traditions, Environments, communications, oblasts, villages, Associations, federation, groupings, promotion, republic, attractions, Rivers, institutions, remains, situations, requirements, Governments, horizons, directions, Regencies, Resources, contributions, reasons, regimes, reserves, years, reports, Prices, Islands, Undertakings, positions, implications, waters, principles, constituents, cohesion, heartlands, people, terms, worldwide, instruments, managers, corners, initiatives, synergies, respects, times, spheres, chiefdoms, enterprises, terrorists, matters, questions, ridings, landscapes, Opportunities, rooms, enclaves, Languages, Sons, everywhere, concerns, mountains, domains, settings, findings, Peripheries, things, Industries, Cultures, counterparts, contracts, components, echelons, prisoners, indicators, grounds, directorates, kilometres, points, NGOS, Economies, centers, residents, circles, engines, Into, in, PORTS, Gentlemen, advancement, place, documents, disciplines, issues, Stations, sources, prairies, labrador, instances, pieces, fragments, tourism, Entities, notes, actions, ORS, projects, groups, participants, toronto, african, elements, L, centres, markets, exchanges, statistics, manitoba, partners, parks, Measures, wilayas, spots, homes, quarters, priorities, topics, premises, Ros, surfaces, affairs, velayats, Coins, proposals, Businesses, Realities, pockets, trips, users, comarcas, backgrounds, fronts, Agencies, Ones, modules, expenses, links, Households, Branches, sides, statements, departments, species, venues, annexes, levels, values, ways, inmates, change, changes, costs, item, items, employees, Crimes, needs, mandates, programmes, structural, citizens, aliens, wedges, Companies, players, Grants, segments, amendments, places, havens, streets, altitudes, theatres, aspects, bands, belts, Programs, special, women, practices, men, Firms, products, artists, how, subjects, reaches, loans, -rrb-, spaces, cattle, seats, Activities, media, Drives, Bodies, aids, athletes, cases, Patches, themes, members, stars, actors, ponds, shares, problems, hot, Policies, Lives, Crises, kinds, wide, units, marks, types, yuan, meetings, pools, sets, Parties, 27, data, C, blocks, counts, 83, 2005, S, fields, LINEs, 41, 2000, agency. But neither was it in the regions of the North. New regions are to be occupied; there is to be daybreak everywhere! reawaken, Rosh Hashanah, rescission, rich man, racism, russian, raisin, reagin, raceme, rogaine, reason, regime, ruskin, reckon, roughhewn, recession, requiem, racon, rose wine, rhizome, Rosh Hashonah, resign, resume, regimen, rousseauan, reign, rose gum, reexamine, rejoin, ryukyuan, rajanya, racine, re-assume, rake in, reassign, resin, Rosh Hashona, regain, re-examine, rough in, roughen, Rosh Hashana, raw sienna, rosin, Riesman, raccoon, racoon, Rosa Canina, resiny, ricin, regina, reagan, risen, recission, Reggane, rossini.